So I have a confession to make, I'm obsessed with something weird again, and this time it's Play Doh. I had this strong urge to make some rune stones from clay. I've done it before with a batch of air dry clay and while it was a pain to work with it was something I wanted to try again. I went out in search for my clay, but when I got to the store, they were completely sold out. I stared at the empty shelf in dismay. How could the internet lie to me and say that they had it in stock? On my walk of shame out of the store, something caught my eye. On a random aisle I spied big packs of Play Doh on sale for $1.75 a piece. I thought, shoot, for that price, why not give it a try? 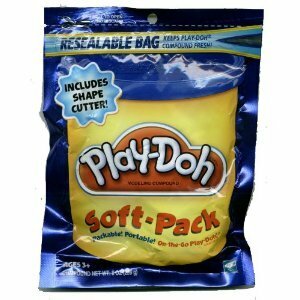 So when I go to buy them, to my utter surprise they ring up 50 cents a piece for a roughly 10 oz bag of Play Doh. It was an incredible deal considering that in the crafts section they were selling 2 ounce cups of the stuff for an insane mark up. I scurry my loot back home and get to work. And after getting past the initial stigma of "Play Doh is for babies" I actually really start to like the medium I'm working with. Unlike air dry clay, Play Doh was a lot less difficult to work with in a lot of ways. It wasn't as messy and it didn't dry out as fast as air dry clay. It has a smooth and almost plasticky texture and was easy to manipulate with tools and my hands. As I worked with the Play Doh I couldn't help but wonder how it would hold up compared to the other clay that was designed to harden and "keep forever." The reason I wrote this post, however, is because of one main complaint I have about Play Doh: Nobody really seems to know much about its actual properties or how to do cool stuff with it. I searched voraciously on the internet for informative tutorials on the subject, looking for examples of fine art Play Doh sculptures, advice on painting it or different crafts to do with it. Sure, I found a few things. I found a lot of videos by pre teen girls sharing their Play Doh charm collections (which were actually pretty awesome) and many links to that pinterest craft about making your own Play Doh and making an ornament of your baby's hand or dog's paw or something. I even found one example of Play Doh used in a fine art setting where the artist cut out many colored swirled circles of Play Doh and made intricate mosaics out of them. All well and good but, where's the real answers to my questions here? I couldn't find much on anything. It was then realized that I was going to have to lead by example and write about this pressing matter myself. Like a mad scientist, I will have to record my findings. Here is one woman's attempt to answer "Frequently Asked Questions" for any strange soul who decides they want to do something serious with Play Doh. To conduct my "experiments" I started out with just a few basic projects to see how it worked including some different charms and magnets. As a disclaimer, this is all just based off of personal experience so far, and I only experimented on smaller pieces and not any large ones, so the information may not be completely accurate or applicable to you. However, at the very least this should be a good jumping off point for any curious crafters out there who want to seriously try Play Doh for themselves. Play Doh and Salt Dough- What is this stuff? First of all, what is Play Doh? It's actually more close to a cookie dough than actual clay. Most clays have an element of soil or mud to them but Play Doh is mainly made up of salt and flour. That's why there are so many recipes out there to make your own, and why Play Doh has to advertise itself as a "modeling compound" and not "modeling clay." This is also the key to keeping Play Doh nontoxic and, weirdly enough, edible. When people make this stuff themselves, they call it Salt Dough. Whenever you see an artist saying that they use "salt dough" know that they secretly are using a derivative of Play Doh and don't want you to judge them for using a modeling compound supposedly made for children! Interestingly, if you search for salt dough projects you will get more serious results than Play Doh even though they are virtually the same thing. How do you dry out Play Doh without cracking or crumbling it? There's a few strategies I found to achieve this. A lot of people suggest cooking it in the oven like a "normal" piece of clay, but I thought this seemed kind of reckless considering how notorious Play Doh is for cracking and crumbling when dry. I have always been told to dry clay out slowly if you are trying to keep it from cracking, so I applied this knowledge to my Play Doh creations. How I achieved this- I left the pieces on a tray to dry in a fairly cool place that was not next to a draft. I also kept it away from extreme heat, sunlight and humidity. In short, I just left it on my desk for about a week. So far, I can say that none of my charms or bits experienced cracks or crumbles. Just try to keep your sculptures on the smaller side and avoid long thin pieces that extend outside of the sculpture and you will be pretty safe from cracks and crumbles. What you really need to look out for is salting. 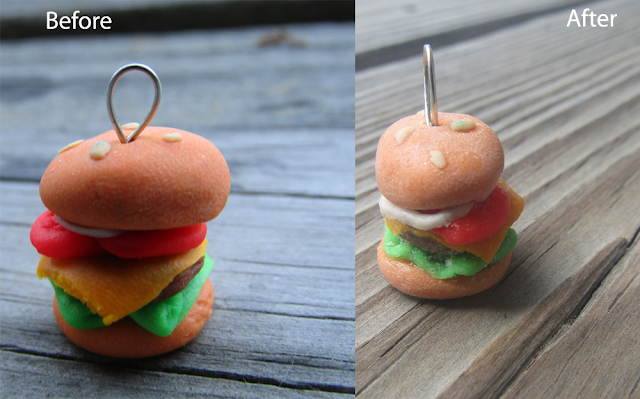 Untreated Play Doh Hamburger, before drying and afterwards. Notice the deposit of salt on the surface of the figure in the second image. So Craftastic suggests drying the pieces evenly, but I personally haven't found much of a consistency with this technique. My first batch of charms were flipped and turned and rotated to high heaven in order to ensure that every square inch evenly dried, however this didn't seem to have made a difference in the inevitable saltiness of the pieces, if not pronouncing the problem even more. However, I have to note that your results may vary with this technique. I live in the south and experience a lot of humidity. I often wonder if how arid or humid your environment is may effect the drying process in general. The science behind this is beyond me, but if you want to keep your pieces untreated, you'll have to experiment for yourself to see exactly how it reacts to your personal drying location. On the other hand, I actually discovered that if you leave the pieces to dry flat and don't move them much, that most of salt will settle at the bottom / on the backside of your piece. This only really works if you are doing a two dimensional sculpture, but I had great success with those kind of pieces. The timing for this is tricky because you don't want to seal it when the piece is not dry enough (still malleable/squishy) because it's unlikely to harden evenly, but you don't want to wait too long because once the salting process starts it becomes much more difficult to make the sealer or paint stick. I was having a big problem with this when I was painting those first charms that had completely salted over. The salt was drying out and gunking up the adhesive and it was hard to get it a neat and smooth coat. I had to do many thin layers and really take my time with it, very annoying for one little banana! Even with all of this thought behind it, I suspect there is no way to completely avoid having a little bit of a salty texture to your finished piece if you are using Play Doh, but you can get it to a point where it isn't very noticeable, or even create a design that uses the effect to its advantage. What kind of sealant should I put on my Play Doh sculpture? Personally, I just used Mod Podge, and it seems to work okay. It was cheap, readily available, and easy to wash off my hands and my brushes. It gives the crafts a fairly smooth texture and shiny finish. Try to make thin, even layers over everything, building up layers one by one slowly. Avoid pooling the sealant in any of the sculpture's cracks- I noticed that if I painted on the mod podge too thick, it didn't completely dry invisible for some reason. Curious on other options for sealants I decided to pick the brain of Lacy Knudson of Dozayix to see what she used to seal her incredible Play Doh mosaics. About sealants, she says: "I use a two-part UV resistant resin called EX-74 sold by Environmental Technologies Incorporated. I buy it through a local distributor here in San Diego but the website is here." There are also varnishes available at the craft store that would work as a low cost "weatherproof" sealant, but I haven't personally experimented much with the stuff on Play Doh yet. * However, I think the effect of sealing the pieces is not only more professional but pleasing to the eye, and if you get a chance to incorporate resin, varnish or other substantial sealants, I'd highly recommend experimenting with them. *Edit: So I tried the varnish and it's no good. It just brushes right off, doesn't bond with the oil or salt in the Doh I suppose. However, I discovered that GLOSS Mod Podge works great! It takes to the sculptures a little better than Mod Podge Matte does (which is what I've used so far) and also seems to even clean up some of the salting effect. I would reccomend Gloss Modge Podge as a great starter sealant for Play Doh sculptures. One of Lacy's Knudson's mosaics "A New World"
made completely out of Play Doh featuring a shiny resin finish. Should I use water to moisten my sculpture as I go? Probably not, which is actually one of the things I like about Play Doh. Just manipulating it with your hands can smooth most cracks and creases. For the sake of comparison, this is very different from air dry clay. With air dry clay, I found myself constantly feeding it water, smoothing over cracks, trying to moisten pointed tips so they wouldn't crumble off. My hands were constantly a crusty shade of mud white, the clay caking to my hands as I worked and shedding everywhere I touched, including my clothes and work space. Not so with Play Doh. Play Doh contains mineral oil which keeps it smooth and more malleable for a longer time, but as we all know, oil and water don't mix. The only time it would be useful to moisten your Play Doh is if it's completely dried out and has time to sit and soak for a while. Little droplets as a smoothing attempt are likely to just roll off. If your Play Doh is getting too dried out while you work, you're probably leaving it out too long. Put it back in the container when you're not using it, only expose the doh to the air when you are working on it. If your sculpture is small enough, you can put it back in the container/packet for a bit and it should absorb some of the moisture from the rest of the Doh. . I did NOT cook this pizza in the oven. to "bake" your Play Doh. I think they do the best by curing/drying over a long period of time. They become workable with other media like paint and varnish within the first few days (3-4 days of drying), but the longer you let them sit, the harder they become over all. I have noticed something though. Depending on the weather/temperature/some unknown factor, the dried Play Doh seems to be inconsistently somewhat harder or softer on any given day, especially the untreated pieces. To me, this difference is an even stronger indication that the Play Doh compound is effected by its environment. Just keep that in mind when storing your pieces. Can you paint it, and how does the paint react? Just regular ol' acrylic paints seemed to fair well on semi-dried pieces of Play Doh, but I had similar problems to when I was trying to seal them- if the piece is salty, it will be more difficult to apply the paint smoothly. Two thoughts on the subject: Firstly, if you have access to the full rainbow of colors that Play Doh has provided you, use them! I was lucky to get that sweet sale that allowed me to get a full palette. The colors mix extraordinarily well in my opinion- I was able to get the colors I needed by mixing them. However, if you absolutely feel hell bent on painting it by hand, no worries, I had the same sentiment. I experimented with these little cockatiel charms by sealing it over with mod podge and then painting on top of that. Painting over it with gesso or sealant before you begin to layer the paint will make your life easier because it will smooth over the surface. Speaking of which, I discovered, the "crumbles" from carving into the compound will also gum up your paint. For example, with my rune stones, I had to be very careful when creating and painting inside the carved symbols. I resorted to taking a tool and trying to scrape out some of the carving crumbs but to no avail. It seems better to just try to make smooth, even grooves, creases, shapes ect, if you intend on painting them, because the paint will go on much more neatly and easily. A pisces charm that has been darkened with metallic blue gel pen color. Another coloring technique to think about is markers and gel pens. I had great success with colorizing these purple rune stones with a glitter gel pen - I used its tendency to smear to my advantage and the effect gave it a very interesting look. Let the ink dry and then carefully varnish them to avoid smearing detailed lines. You may have to paint over only the lined parts to keep it from smearing, especially if your marker/pen was not waterproof. I may do a follow up to this post sometime in the near future as I continue to learn about the properties of this humble but deceptively handy "modeling compound," so think of some good questions for me! Right now I am experimenting with making relief sculptures. Now to just figure out how to keep them from curling up when they dry flat... Anyways, to send you off with some inspiration maybe, here's some of my other charms. By the way, you can check in at my new Etsy store which will have charms and other fun things available for purchase very soon. Stay tuned and in the mean time, remember to leave a comment if you have any questions or your own thoughts on the serious matters of Play Doh! A bunch of banana charms! My first attempt at a pizza charm. A more complicated "supreme" pizza charm. A bunch of little skull charms. Carrots, pickles, and apple cores, oh my! Weiner Dogs Charms, get it? I had not heard of this. I like your examples.